Pull up a chair and get ready to go deep into the dungeon. Players will use epic weapons and heroes to defeat terrifying monsters. The catch: the only way to gain these remarkable items is to draft them from the community deck before your opponents. 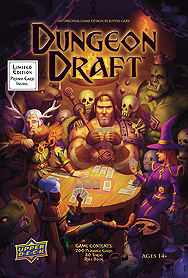 Upper Deck delivers a strategic drafting game built for those who love to...wait for it...Draft!